The early summer transfer activity continues apace, and Forest Green Rovers are setting out an early marker as they look to establish themselves as one of the promotion favourites next season, signing two experienced and prolific non league strikers. Andy Mangan has rejoined Rovers after being released by League Two club Fleetwood Town, where he had spent the last two seasons and won the 2012 Conference title. Fleetwood announced that twenty six year old Mangan would not be offered a new deal, prompting rumours that he might return to another former club in Wrexham. However, Dragons boss Andy Morrell said that he it would be unlikely that the club’s reduced playing budget could accommodate Mangan, allowing their promotion rivals for next season snap him up. Mangan had been at The New Lawn from 2008 to 2010 following his release from Bury. 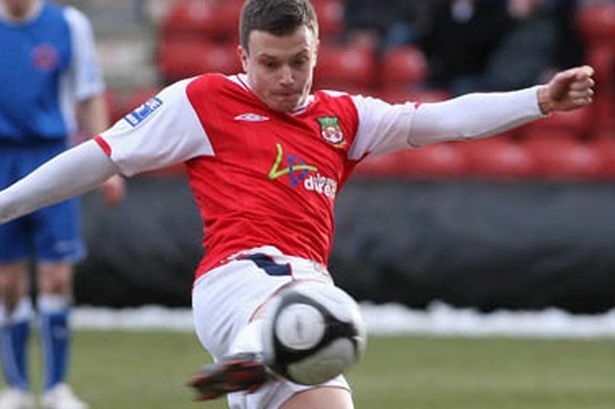 He made his name with the club, scoring thirty goals in forty nine appearances, and finished as the Conference Premier’s top scorer in 2009 before moving onto Wrexham. Mangan is the second frontman to be snapped up by Forest Green, after Danny Wright left Wrexham to move to The New Lawn on a two year deal earlier this month. The twenty eight year old was Wrexham’s top scorer this season, but missed out on the Conference playoffs after dislocating an elbow in a match against Braintree Town. The signing of these two prolific Conference strikers is sure to worry their rivals for next season’s title. Posted on May 16, 2013, in UTL Archive and tagged Andy Mangan, Danny Wright, Forest Green Rovers, Transfers. Bookmark the permalink. Leave a comment.